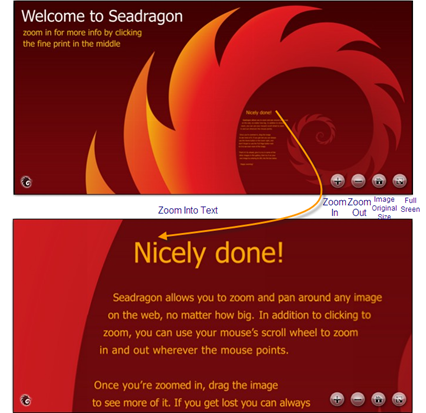 SeaDragon, a web app created at Microsoft Live Labs, that lets you create a zoom capable photo without the need to open the image in fullscreen to just zoom into the image.There’s also an free iPhone app for SeaDragon, so that you view zoom capable images in your phone.You can zoom into and also move the zoomed image by dragging with your mouse. With a wheel mouse you can zoom in/zoom out more easily using the wheel. To restore the image to the original size, click the Home Button, or to view the Image in full screen click on the Full Screen Button. The iPhone SeaDragon app works on iPhone and iPod Touch and OS 2.1 or higher. To test SeaDragon’s capability you can head to their site : SeaDragon, and try out some sample images or just enter the URL to an image on the web and to see the zoom capable image generated that you could embed on your blog/site or share it on the social media.